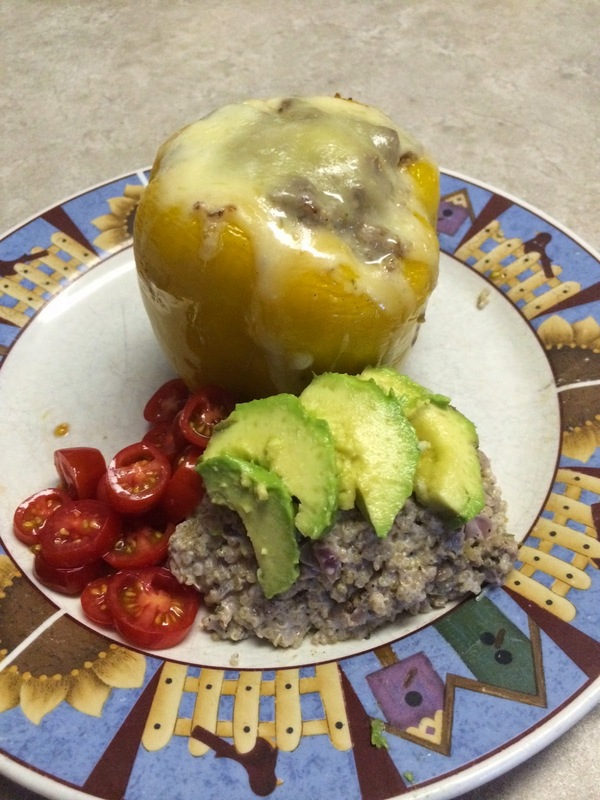 Sometimes you just want to eat a good stuffed pepper. My problem with them is they take a while to make. If you haven't made them before maybe this will help! I chop a red onion, some garlic and open up the pepper. Take 1 pound of ground turkey meat add it to a pan on medium high with the onion, garlic and olive oil. Then preheat the oven to 425F. In the meantime the meat, onion and garlic are cooking in the pan. 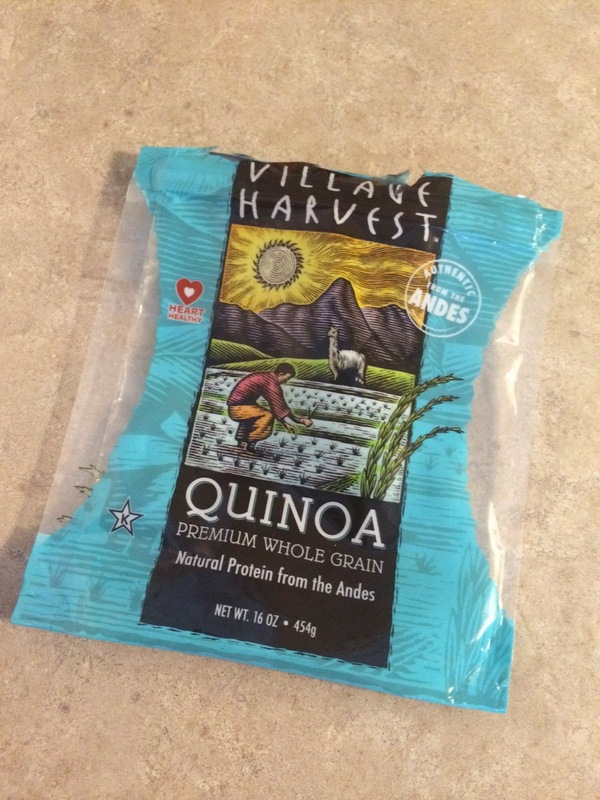 Now I make quinoa per the directions on the package. When the quinoa is finished, I put it in the pan with the cooked meat and onions. Next, I add salt, pepper, oregano, red wine vinegar, and parsley. Turn the heat to low for a few more minutes. Taste your mix, season a little more if necessary. The meat is all cooked and quinoa all mixed in. Put the mix inside the bell pepper. Now stuffed, the peppers go in the oven for about 15 minutes. You can cook them longer if you want a softer pepper etc. Ground meat- I used turkey, you can use beef if you like. 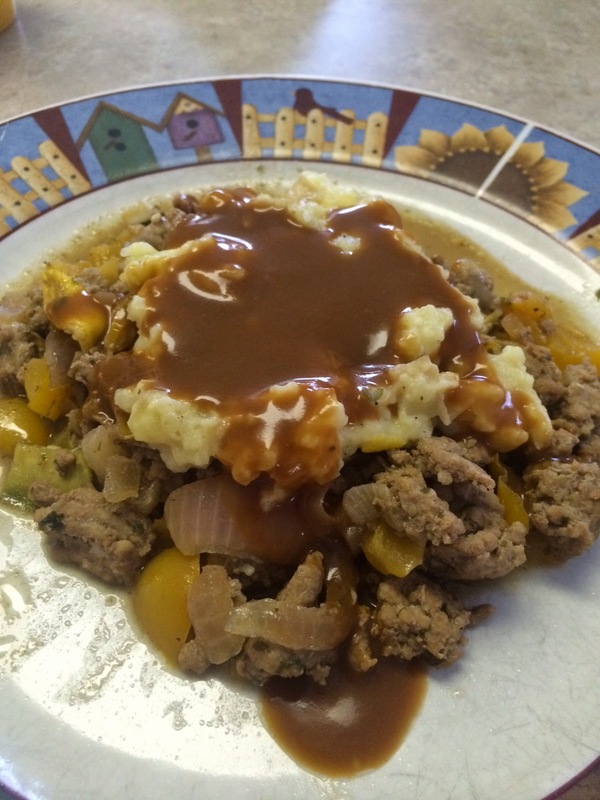 I love shepherds pie! I really don't like to bake it though because I spend all that time preparing it then I have to bake it! Here is what I made. Cut up the onion, zucchinis, bell peppers and garlic then throw it all in a pan with enough oil to lightly cover the veggies. Cook at medium heat. After the veggies are added, put the turkey burger in so it can cook with all that onion and garlic. YUMMY! The meat and veggies cook in about the same amount of time. Now splash a bit of wine vinegar, salt, pepper. Brown the meat then reduce heat to low. While you are browning the meat, boil the potatoes. When the meat is browned, add the Worcestershire sauce to flavor. Then mash your potatoes with a bit of milk and butter. Make up a little gravy and you are set! I hope this is as good for you as it is for me! Enjoy. I Can Make My Own! We recently adopted new kittens from our local shelter and they are in need of a scratching post. I realize that a scratching post for kitties is simply some carpet and wood. I just so happen to have this laying around. I gather up a few 2x4’s for the post and screw them together. I get a few square pieces of plywood for the platforms. I then screw these to the 2x4's. Building the structure was rather easy but putting carpet on is a different story. It is difficult, but with a sharp knife and a bit of patience it can be properly executed. Carpeting a cat structure will take a little practice but below is the finished result. You can also see the kitties in action HERE on our VLOG! Since I built this myself I saved about $60-100 or so which is awesome! I am very happy I made our own scratching post. I would also recommend this to anyone if you have the materials laying around. It can save you a bit of money for the amount of time spent making it. I think I will make a few more pieces, maybe a little more elaborate with ramps etc. The best part about making cat toys is they aren’t too picky about how nice it looks.